What is a Past Life Reading? This combination astrology and soul reading will help you gain a better understanding of who you are so that you can maximize your potential and natural abilities to the utmost of your ability. Real growth comes from understanding and transforming behavior patterns so that you can challenge yourself to develop in new and exciting ways based upon a knowledge of your past lives. You can view more sample readings here. All I can say is WOW. All the lives you saw are different versions of who I am now. It was kind of eerie, in a good sense. I still have a bit of Ella in me… Like Ella, I am always catching a glimpse of someone or something in the corner of my eye. “I also catch a glimpse of several other lifetimes:- I see you as a young blind woman with a big heart.” Being blindfolded or in the dark is a very uncomfortable place for me to be. I get very panic stricken. As for the big heart.. I retained that quality. “- I see a mother with a whole brood of children – she is very happy.” I adore children and always wanted a big family. I have 3 children but often regret not having more. I think I am living my Gorte time period again. I am still mulling that one over. It hits me very hard. The life lesson from Gorte: Life Lesson: You suffered great loss in this lifetime, but you survived it and you returned. You discovered how resilient the heart can be and what family means, but you only truly discovered this at the very end of your life. I have had a very trying life as RuthAnn…much loss and deliberate separation from the only living person in my immediate family, until last year about this time. I made the move to reconnect because I feared it was coming close to the end of my brother's life. ( he is 65 and I am 50) and this section “You discovered how resilient the heart can be and what family means,” brought me to tears. My 3rd lifetime you tapped into made me giggle. I am fascinated with midgets and I am a large woman that loves my home dark. As for the artist.. ahhhh How I wish I could be or could have known what it was like to be an artist, since in this life time, I am a colorblind woman. An area that did not resonate with me was in the tendencies to leave behind. I am not selfish in the least. Everything else was spot on. Thank you.. this helps me so much to understand my life and what my purpose may be. *This reading was done for RuthAnn Dickinson in August of 2009 and is published with kind permission. I will begin your past life reading by taking a look at three of your past lives based upon a psychic/soul reading of your past life energy. - In the first lifetime I tap into I see an image of something flitting and flying all about – it appears to be from the Faery realms and her name is Amoertella! - The time period is the 1880’s in England. - Ella dreams of this faery, but she doesn’t remember the dreams. - Ella is also associated with a large white flowering bush. - She is from a well-to-do family and she becomes a writer. - One day Ella sees this faery out of the corner of her eye and that comforts her. - It is Ella’s emotional needs that call the faery to her. - Ella’s writing became more in-depth after she sees the faery and she also starts to write columns in the paper. - I pull a card from my Fairy Herbal Healing deck to take a closer look at Ella and her fairy and it is called “Diogenes Lantern Fairy”. Diogenes Lantern (a member of the Lily family) is a feminine herb ruled by the Moon and the goddesses Venus and Juno.It is a protective flower that has been used to break love spells involving a specific person. - Ella’s writing was of interest to both scientists and children. 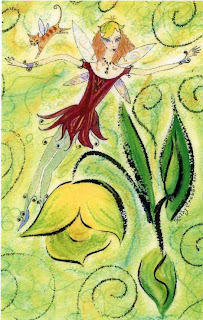 - The faery stayed with Ella until she died and helped her cross over to the other side when her time came. Life Lesson: This was a lifetime where fantasy and reality intertwined bringing new realities and dimensions into both your own life, and to all of human-kind. These lessons contributed and fit quite well into the enchanted time period of that particular time in history. - I see you as a young blind woman with a big heart. - I see a wild horse with a bandito rider. - I see a mother with a whole brood of children – she is very happy. The second lifetime I tap into also takes place in England, but during Robin Hood times and your name is Gorte. - You are a traveler, a simple man and you look like the person depicted in the Fool card from the Rider-Waite deck; you are wearing the same hat. - I see you always on the road, whistling, free and at ease. - Sometimes children follow you and you play games with them. - You’re not searching for anything, until one day you meet ‘her’. - This reminds me of a fairy tale! She of course, is unattainable, so you do everything you can to win her hand and eventually you do. - You become a part of the castle that she was born into and have two children with her – a boy and a girl. - I also see a wishing well at this castle. - You are blissfully happy, but your wife dies at a young age. - You end up leaving your two children behind because you are so devastated and you just disappear. - But one day you return to the castle as an old man and you work in the kitchen to be close to your family and you never ever reveal your secret. Life Lesson:You suffered great loss in this lifetime, but you survived it and you returned. You discovered how resilient the heart can be and what family means, but you only truly discovered this at the very end of your life. - My first image of you is as a very large man living in a great, dark home filled with large, abstract looking paintings (abstract in a sort of Japanese aesthetic way). - You are the painter and when you paint it appears as though you are conjuring up paint as if it was smoke! - I see a woman named Marie wearing a floor length gown in the background, but it’s your art that is your primary passion. - You are not French born, but secretly Polish and a count (you hide this from everyone) and your mother may have been Swedish. - You do have money. - Sometimes you dabble in the black arts – you are drawn to all that is mysterious. - You also hire midgets as your attendants! - Everything you do is larger than life - your muse and your passions. - At one point you just leave it all behind and sail home to be near your mother who needs you and who you tend ironically, until your own death. Your mother does manage to outlive you. - You lived too much in too short a time, but you die happy and at your mother’s side. Life Lesson: Like a spoiled child, you conjured up great passions, but in the end you returned home knowing that you are doing what is right. You led a wild and grand life that took its toll, yet your heart returned home in the end and you died a fulfilled man knowing this. In astrology, the Moon rules our feelings, our moods, and our emotional bodies.It is the most important planet in our chart from a karmic/past life perspective.An analysis of the North and South Nodes of the Moon will help you better understand your Karmic Mission for this lifetime based upon your past lives. Your North Node is in Libra in the 9th House (the Sagittarius House) - Your present life. Your South Node is in Aries in the 3rd House(the Gemini House) - Your past lives. With a Libra North Node you need to be aware of selfishness because it is a bottomless pit – no one else can fulfill your needs for you. Satisfaction lies in connecting with people who see you for what you are.When you support others unselfishly that energy will eventually come back to you and help you create the kind of situation you really want.You also need to watch out for an un-ending search for independence.Accomplishments and independence will not make you feel complete. You could be a fantastic counselor, diplomat and peacemaker because you have the gift of clearly seeing and communicating mutual understanding between people.You could also excel in fields involving beauty and art.You would make a great entertainer or public speaker as long as your goal is to uplift, energize and bring confidence to your audience.Any profession in which you play a supporting role will be successful for you. You have past life gifts of independence and leadership and you can use these gifts of self-confidence as a tool for peacemaking and helping establish justice for others.However, if you pursue professions that have your own independence as the aim, you may become dissatisfied and feel you have never reached your goal.When you use your strong self-identity to support others, you gain a sense of inner satisfaction and completion. You had many past lives as a warrior where your entire focus had to be on keeping yourself alive and this has made you quite competitive and goal oriented.In the process you may have lost touch with love and the ability to work with other people, but this lifetime is all about partnership and there will be plenty of opportunities to get it right! You also might have an exaggerated survival urge and a “me versus you” mentality.It’s all you’ve known. But this is not a warrior lifetime, no one is out to destroy you or take things away from you.You need to realize you have comrades on all sides.Your job in this lifetime is to help others win battles, and in doing so, you win. You may find yourself on an unending search for information in a desire for mental security and on a search for truth. The bottom line is that you will never have enough information to know what the “truth” is. At some point, you need to go beyond logic to your intuition, and demonstrate what your higher truth is telling you. Real growth is only possible when you learn to let go of control and follow your intuition.Acting from your own truth will draw out your integrity and bring the right people to you which will help give you the security and peace of mind you seek. You are highly intuitive and can excel in the psychic fields. You can also be successful in situations involving interactions with foreign countries.You are happiest when using your talents to find solutions ie. lawyer, religious or spiritual leader, professor, publisher, or a role in advertising – promoting various causes that you believe in on a mass level. You have a gift for foreseeing probable outcomes and when you verbalize this you can create win/win situations. However, if you work in professions where understanding and reporting how others think is the goal you may not fare as well. Teaching mundane subjects or working with projects that deal with fact rather than inspiration, can promote uneasiness and fear of being hurt unexpectedly. You have spent many lifetimes in positions where it was essential for you to understand how others think: as a teacher, writer, orator and salesperson.You have the talent of seeing everyone else’s point of view, but in the process have lost touch with your own truth. Now you need to connect with your spirituality and rediscover yourself. You also have the gift of gab and can see into the mindset of other people. You may have a tough time making decisions because you are accustomed to seeing both sides.To avoid this problem, you must not allow yourself to question your first feeling of “knowing.” Your intuition is usually accurate. Be careful not to slip into telling white lies. Your special gift in this lifetime is truth.When you can honestly and directly reveal your own point of view, others will respect what you say. The desire to win is also correct and healthy for you. You have a positive, cheerful and outgoing nature and are attuned to insights from your Guides and Angels. When you become negative, it’s because you’re thinking too much. As you relax your mind, your natural faith in positive outcomes will be able to re-establish itself. It’s also healthy for you to retreat from society, and spend time outdoors, with animals, and in nature. Regular exercise, meditation, hot baths and swimming will help you relax. To view more sample readings please click here along with client testimonials here.